THE SKINNY: I love the idea of most of Organix hair care products, but they rarely deliver what I expect. That holds true for the Coconut Milk Shampoo and Conditioner, bought on a whim at the drugstore. They do smell fabulous and beachy. But they don't do fabulous things for my fine hair. The shampoo and conditioner contain coconut products and egg white proteins that are supposed to hydrate and nourish. By itself, the shampoo leaves my hair clean and shiny but feeling a little dry. I need to add the conditioner to get that hydrated and nourished feeling. And after continual use of using the conditioner, my head starts to itch because it's too much hydration for my scalp to take. KEEP OR TOSS: Keep, because I do love the smell, but use sparingly. It's currently parked in the guest bathroom. 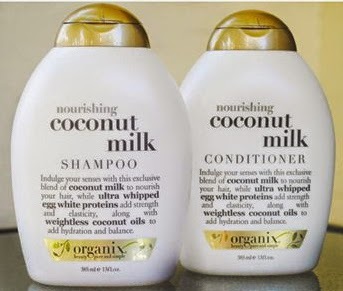 CHECK IT OUT: Organix has a whole line of products made with coconut milk.